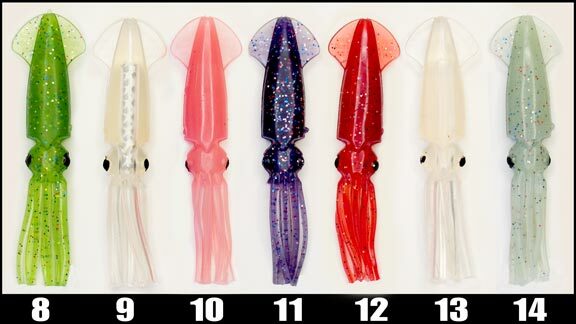 The ORIGINAL, (Often copied, but never duplicated) SQUIRT SQUID is soft, but no too soft. Amazing action and fish catching ability. The most successful lure for Giant Tuna, it produced the largest Tuna on rod and reel in the U.S.A. of 1,228 LB. They also make great SPREADER-BAR rigs and DAISY CHAINS. 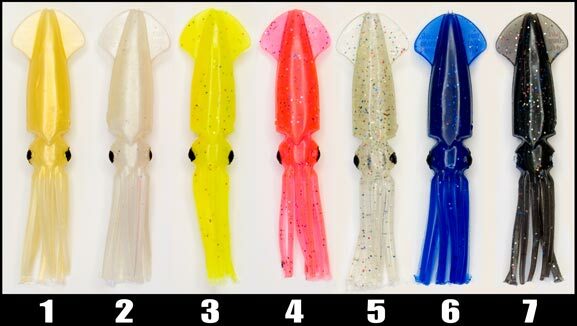 Use the 6" and 9" SQUID DAISY CHAINS for Sailfish and smaller game fish, and the 12" SQUID DAISY CHAINS for Tuna. Multiple Work! 5706B 6" Squid Bulk - No Minimum 6"
5709B 9" Squid Bulk - No Minimum 9"
5712B 12" Squid Bulk - No Minimum 12"
5716P 16" Squid Bulk - No Minimum 16"
5006P 6" Squid Packaged 6"
5009P 9" Squid Packaged 9"
5012P 12" Squid Packaged 12"
5016P 16" Squid Packaged 16"
5506PR 6" Squid Rigged & Packaged 6"
5509PR 9" Squid Rigged & Packaged 9"
5512PR 12" Squid Rigged & Packaged 12"
5516PR 16" Squid Rigged & Packaged 16"
Most Senior and Standard lures also avalible in these colors. © 2013 Mold Craft Products, Inc.